This is an outstanding book for elementary students. It introduces exploration and invention and then expands on what readers have read or viewed in the book. The simple language, coupled with amazing photographs of animals and their tongues, makes this book a great choice. The information is factual as well as highly intriguing. The factual information is aligned to humans and their experiences. For example, when reading about the speed of the chameleon’s tongue, the author states, “Its tongue is fast and long.” Then the author asks, “How fast is fast?” To find out how fast this is, the author encourages the reader to “clap your hands together once or snap your fingers. In the time your hands were together, a chameleon’s tongues could have shot out of its mouth 16 different times!” This activity meshes with the reading and provides an authentic experience to build scientific knowledge. In addition, the book has trivia snippets throughout the text. The snippets are fun to read and provide the beginnings for searching for more about animal tongues. A glossary defines words that some young readers may not know. While reading the book, there were times I had to say, “Gee, I didn’t know that!” In short, this fascinating book and its photographs will entice readers of all ages. And it will prompt them to want to find out more and more about tongues. Who would have thought that tongues could be so diverse? 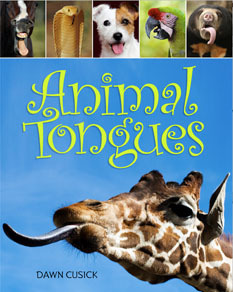 This is a great book for discovering the many different types and functions of animal tongues. A large range of animals from all over the world is covered, and vivid color photographs show this muscle at its best. An important thing to note is that in the process of learning how animals use their tongues, young readers likely will learn about their own tongues, by comparing humans to their animal subjects. Although the chapters are short, they are full of incredible information, such as the amazing speed of a lizard's tongue. The writer speaks directly to the reader, asking silly questions such as, "Can you stretch your tongue to your ear?" Cusick provides many simple examples to demonstrate certain points, such as the significance of the rough texture of a kitten's tongue, which is something that many young readers will have felt before. This book includes a glossary and an index.